There isnt really any cenotes close to cancun. Most of them are in PDC and south of that down the highway towards tulum. Again senor cruz will hook you up but my vote is Sac-actun dont miss that one. Got it. Thank you. Got ahold of Senor Cruz and he’s picking us up tomorrow early and taking us to several. Thank you again. Do you remember what this one is called? I'd love to find this one on the map to try to find a place near it! Wish I could be your travel buddy! Mid- January can’t come fast enough for me. Do you remember what this one is called? 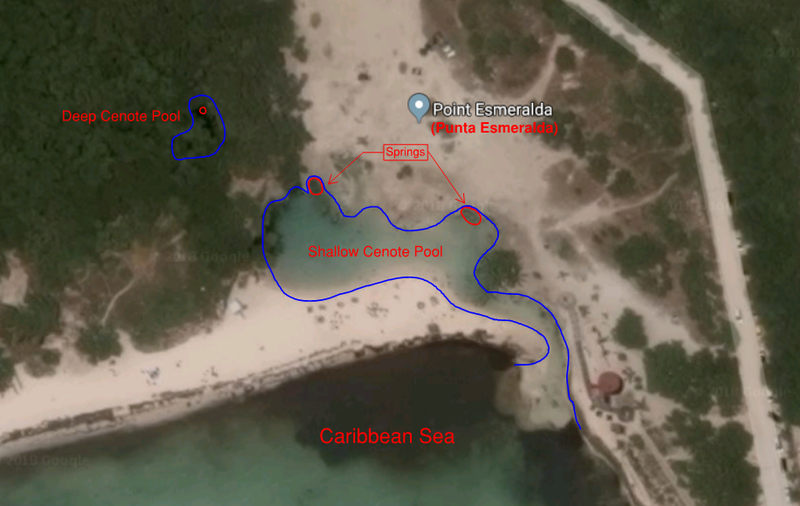 Google calls it "Point Esmeralda" (Punta Esmeralda en Espanol). I've seen it referred to as Playa Punta Esmeralda online, but I usually just call it Playa Esmeralda. Rena3 and Gina R like this. Thanks! And I wish we could be travel buddies too but I'm glad you've got your plan set! My dear, if there’s one thing I’ve learned, no plan is ever set. That said, yes, I look forward to whatever the future brings. And I’m brushing it along in the direction I think it’s supposed to go. drezy and Gina R like this. He's solid. I think you'll like your time with the man. Enjoy! I always bristled at "5 year plans". Don't get eaten by a bear. I'm pretty sure 5 year ago me and 5 year from now me agree with me on that goal. Corey Nelson, caroline and Gina R like this. You are correct. He was terrific and we will use him again for the next trip. Very good man. A good resource as well. Sun Disciple and drezy like this. I had a really good thought provoking discussion with him roughly around social entropy and personal responsibility. Up to that point I had no idea there were perspectives that were non-Texan that had any merit at all. That one was too easy. Obviously everyone's entitled to their own wrong opinion. I met a friend last year in PDC. She lives in Veracruz Mexico. I will be moving to Latin America on December 9th. I'm going to spend 3 months in Veracruz before traveling south to Guatemala. Does anyone know if Veracruz has an enhanced magnetic presence that far from the impact place? Gina R and OptimalSkr like this. In terms of recommendations, when we went last time, we loved Cenote Azul and the Yal-Ku Lagoon in Akumal. Antonis and Gina R like this. At about 1 minute in, there is an interesting first hand account of how Tulum effects his energy levels. OptimalSkr and Gina R like this. I will be landing In PDC/Tulum area DEC 9th for my annual cenote tour. I will be hitting a different one each day if your in the area between the 9th and 15th feel free to send a message if you wanna hook up. I also found some interesting timbits here is a mineral analysis of 5 different cenotes around tulum. Also I found that Cristal bottled water is sourced from cenote system so it makes a good choice while down there as it should be D depleted. RobInDC, Antonis and Gina R like this. very cool! I'm interested in linking up. I'll be in PDC as of 11th! After visiting many cenotes, Sac Actun is by far my favorite. It's the coldest (and most expensive). Jack Kruse and Gina R like this. Hi all! I'm off to Yucatan tomorrow. I'll be in Isla for a week and then PDC for a week then at some point Tulum. If you are around, reach out and let's meet up! Good for you! I’m in PDC til the 9th.